Most people are now familiar with payday loans, whether they’ve seen them on the high street or online. This sometimes controversial form of borrowing involves taking out small loans, typically between £50 to £1000, with high APR rates of 1000 per cent and more. Payday loans are intended to cover short term emergencies, with the expectation of high charges, and can be an excellent financial option when used responsibly. However, where do payday loans come from, and why have they been so popular in recent years? Payday loans have gone from being a £100 million to a £2 billion industry in the past ten years; much of this success has been down to the global financial crisis and the recession, with more people having to search out alternative forms of borrowing to cover shortfalls in wages and loans from banks. 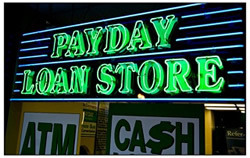 The roots of what we now legally know as payday loans goes back, though, to the United States in the early 1980s, and the deregulation of interest rates created by the Depository Institutions Deregulation and Monetary Control Act of 1980; this allowed more lenders to offer high APR in exchange for quick and easy loans. The basic premise of short term loans with high interest is centuries old, with options always having been available to take on the calculated risk of a loan with high rates of interest. People that struggle to receive good terms from banks, or that require money for emergencies, can always find a lender that’s prepared to offer money in exchange for high interest rates. In these cases, payday and short term loans have been an alternative for those that are unable to build up their credit enough to receive loans from elsewhere. The amount of interest and the calculated risk of a payday loan is generally similar to the terms offered with credit cards and pawnbrokers - you accept that a short term cash advance has to be covered by high interest rates and charges, while knowing that failure to make repayments can result in more charges and debt. Borrowing with payday loans should consequently always be undertaken with an awareness of the terms and conditions of a loan, and the overall amount that needs to be repaid. The particular growth of payday loans since 2008 has been driven by the difficulty that many borrowers experience getting loans through traditional means. Problems with high street businesses have also made it easier for payday loan companies and other lenders to establish shops in towns and cities. This saturation of national and local markets has created controversies over the role of payday loans and their regulation, with many international variations. In the United States, where payday loans have a longer history than the UK as an industry, many states now have APR caps and even bans on some forms of lending, and are more generally governed by the Federal Truth in Lending Act. The UK is likely to see a similar level of scrutiny be applied in the future to payday lending. Discussions are ongoing over whether lenders that mis-advertise or put too much pressure on vulnerable borrowers should be forced out of business. The Financial Conduct Authority will take control of payday loan regulation from 2014, with the expectation being that new restrictions will be placed on lenders that don’t abide by strict rules over what counts as a legal loan. Referrals will also be made to the Consumer Finance Association over whether lenders are behaving responsibly. As long as the economy remains in recession, there’ll likely be a place for payday loans and opportunities for unscrupulous lenders to take advantage of consumers. In this context, it’s crucial to remember that there are many reputable companies that can offer a higher quality service for the contemporary payday loans markets; this can involve advertising clear terms and conditions, and publishing customer charters. By using a company like Swift Money, for example, you can compare the market and have your application forwarded onto different lenders to get the best deals. SwiftMoney also offers detailed information on the cost of a loan. Taking this approach can make it much easier to avoid being hit by unexpected charges, while also making payday loan borrowing less risky in general.